I anticipated that yesterday this evening would be drenched in drama but the Housemates never cease to amaze and last night landed up being full of great music and even greater vibes. The ladies really turned it out, Kat set the tone in a glittering disco ball of a dress, Loko donned a very fitted white number with neon detail, Iris looked tasteful in a monochromatic black and white bandage dress. Poolie who was the epitome of casual meets dapper in jeans paired with a white collared shirt, tie and black pullover. DJ Shimza really outdid himself, playing both local and international club bangers that got everyone moving. Kat even blew him a kiss at the very end and asked him for his branded water bottle. The party was also the scene of a make-up for the previously feuding Mandla and Lexi who could be seen dancing, smooching and holding each other all over that dance floor. Trouble in paradise is no longer for the controversial ‘Mandlexi’ and if its booze related or just pure love, there must be a lot of fans that are enjoying a big sigh of relief for their favourite couple. Actually the real drama ensues after the party has come to a close and the liquor starts flowing which marked Lexi walking up to the red Statue ‘Reggie’ and having a full blown conversation with him, including her giving him some of her drink. This was followed by her bursting into tears and hugging everyone, telling them she is going home tomorrow which rose more than a few eye-brows. 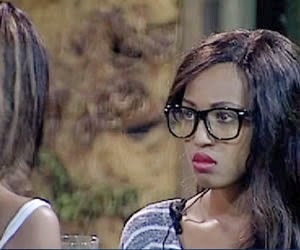 Kat and Iris indulged in a full blown gossip session where they completely bashed fellow bestie Loko, according to them, there is no ‘Lokairis’ and she is not a true friend. The conversation between the two was being constantly interjected by Loko at which point both Iris and Kat would change the topic and act like nothing was wrong. Loko was even screaming “I know Lokairis will be forever’, shame, if only she knew. The twists and turns in the game are only becoming more scathing and intricate by the minute, the end is drawing near so make sure not to miss a beat.